The Renfrew County Catholic District School Board elected a new Chair and Vice-Chair for the 2016–2017 school year at its Inaugural Meeting held on December 5th. 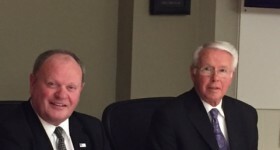 Dave Howard, who had served as Vice-Chair since 2013–2014, becomes the RCCDSB’s new Chair. He is the Board representative for the towns of Deep River, Laurentian Hills and Petawawa, and the Township of Head Clara Maria. The new Vice-Chair is Andrew Bray, who represents the Town of Arnprior, the Township of McNab/Braeside and the Township of Greater Madawaska. Howard added that the Board was committed to collaborating with community partners to provide ongoing support and resources to RCCDSB students and staff. He stressed the Board’s alignment with the Ministry of Education’s goals to increase student achievement, ensure equity, promote well-being and enhance public confidence in RCCDSB schools. Some particular areas of focus for 2016–2017, according to Howard, are Catholicity, technology, mathematics and new initiatives to promote student health and well-being. Chair Howard added that, as the Board’s five-year strategic plan wraps up this year, the Board would be working to prepare a new strategic plan for the future.